Apple last week said it sold a record number of Macs for a September quarter. "The Mac...had its best year ever, with the highest annual Mac revenue in Apple's history," said CEO Tim Cook in prepared remarks during a Nov. 2 call with Wall Street analysts. Apple recorded revenue of $25.8 billion from Mac sales in its fiscal 2017, which ended Sept. 30. Mac unit sales of nearly 5.4 million bested both industry and financial analysts' expectations. Before Apple released its data, research firm IDC had pegged Apple's number at 4.9 million, while rival Gartner offered an even lower estimate: 4.6 million. And according to Philip Elmer-DeWitt, who regularly polls Wall Street for quarterly forecasts, every analyst from a group of more than two dozen undershot Mac sales, some by over half a million machines. Unit sales were up 10.2% over the same quarter in 2016, and the Mac's ASP, or "average selling price," jumped to $1,331, a year-over-year rise of $156, for an increase of 13.3%. According to IDC, the 5.4 million Macs represented almost exactly 8% of the 67.2 million personal computers shipped worldwide in the September quarter. Apple executives explained the bonanza in different ways when they spoke with financial experts last week. "This performance was fueled primarily by great demand for MacBook Pro," said Luca Maestri, Apple's CFO. "[And] we are also seeing great traction for Mac in the enterprise market, with all-time record customer purchases in fiscal year 2017." "Mac revenue growth...was driven by notebook refreshes we launched in June and a strong back-to-school season," asserted Cook. When asked why the Mac beat outsiders' sales predictions, IDC Research Director Linn Huang concurred with Cook that back-to-school sales had been strong. But he had another idea. "To understand 2017, you have to go back to 2016, which was a very poor year for Apple," said Huang. "It ended a very long stretch where Apple consistently beat the [PC] market." True. 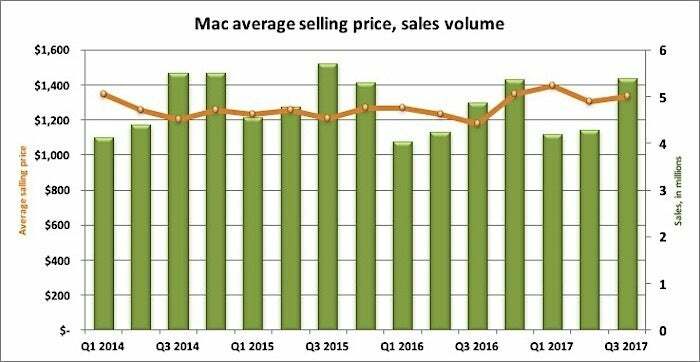 During a four-quarter span - from the December 2015 quarter to the September 2016 quarter - Mac sales declined compared to the same period in the year prior, with three of those quarters recording double-digit contractions. 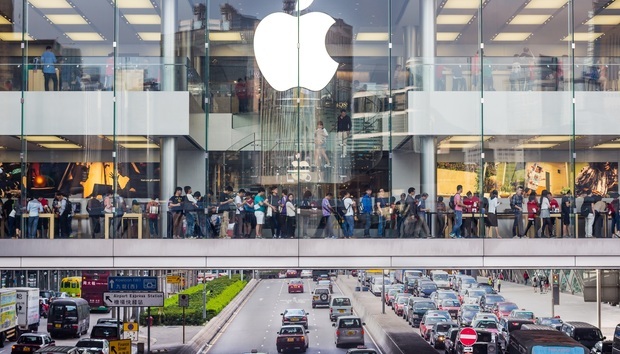 "The biggest grievances were that Apple had allowed their product line to get stale," Huang said of the sales slump. "The notebooks had been refreshed six or seven years earlier, but then just an Intel [processor] refresh every single year. Those soft quarters and the lack of a product line reboot led many in the industry to question Apple's commitment to the Mac, a reasonable inquiry when the iPhone accounted for as much as 68% of the company's revenues during that time. "A lot of that was an over-reaction. But it muted expectations. So, when Apple refreshed their MacBook line-up, it did well, but not alarmingly well," Huang said, referring to the October 2016 revamp, which included price increases to account for the new TouchBar. The immediate response to that refresh was subdued, with the following quarter showing just a 1.2% year-over-year increase in unit sales. Huang counted himself among those who thought that the new MacBooks were getting a mixed reception. "Now I think what's happened is that [Apple's Macs have] been building momentum, and that's finally started to translate into sales," Huang said. Enterprise sales do account for a greater share of Macs, Huang also said, confirming one of Maestri's reasons for the brisk business in the September quarter. But while Apple did not quantify the sales-to-enterprise, IDC's estimates portray them as only a slightly larger piece of the pie. Five years ago, Huang noted, IDC figured non-commercial Mac sales represented 67% of the total. That number has since slipped to 63%, maybe 64%. But the biggest take-away from the Mac's surprising surge, Huang argued, is that the traditional, and nearly immediate, "bump" to Apple sales after a refresh is part of the past. "After a Windows launch, growth rates for PC sales would skyrocket," said Huang. "Over time, sales have become a lot more muted. The same thing holds for Apple and its refreshes. "The PC is no longer the personal device in the household. The PC is a utilitarian device," Huang continued. Customers don't push for a new personal computer simply because another version of Windows hits the market or Apple revises its MacBook Pro. "People wait until [the PC] breaks," Huang said. « From imaging neurons to understanding space - What's happening in science with OpenStack?